Brown-Forman Corporation (NYSE:BF-B) was in 21 hedge funds’ portfolios at the end of the fourth quarter of 2018. BF investors should pay attention to a decrease in enthusiasm from smart money lately. There were 22 hedge funds in our database with BF holdings at the end of the previous quarter. Our calculations also showed that BF-B isn’t among the 30 most popular stocks among hedge funds. We’re going to view the key hedge fund action surrounding Brown-Forman Corporation (NYSE:BF-B). What does the smart money think about Brown-Forman Corporation (NYSE:BF-B)? At the end of the fourth quarter, a total of 21 of the hedge funds tracked by Insider Monkey held long positions in this stock, a change of -5% from the previous quarter. 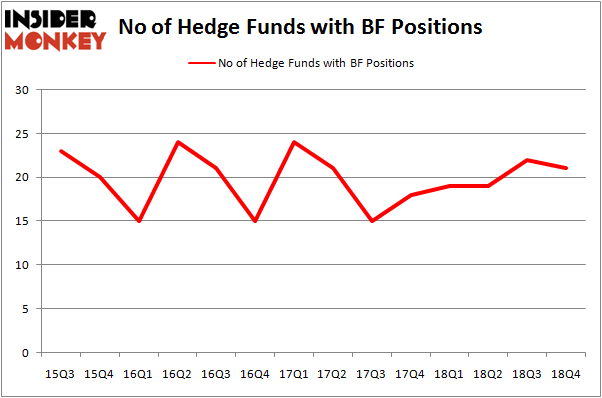 The graph below displays the number of hedge funds with bullish position in BF over the last 14 quarters. With the smart money’s capital changing hands, there exists a select group of key hedge fund managers who were upping their stakes significantly (or already accumulated large positions). Among these funds, Gardner Russo & Gardner held the most valuable stake in Brown-Forman Corporation (NYSE:BF-B), which was worth $200 million at the end of the third quarter. On the second spot was Citadel Investment Group which amassed $58.3 million worth of shares. Moreover, GAMCO Investors, Markel Gayner Asset Management, and Millennium Management were also bullish on Brown-Forman Corporation (NYSE:BF), allocating a large percentage of their portfolios to this stock. Because Brown-Forman Corporation (NYSE:BF-B) has experienced a decline in interest from the entirety of the hedge funds we track, logic holds that there was a specific group of money managers who were dropping their entire stakes by the end of the third quarter. At the top of the heap, Clint Carlson’s Carlson Capital dumped the biggest investment of the 700 funds followed by Insider Monkey, totaling an estimated $18 million in stock, and Joel Greenblatt’s Gotham Asset Management was right behind this move, as the fund sold off about $10.1 million worth. These transactions are interesting, as total hedge fund interest fell by 1 funds by the end of the third quarter. 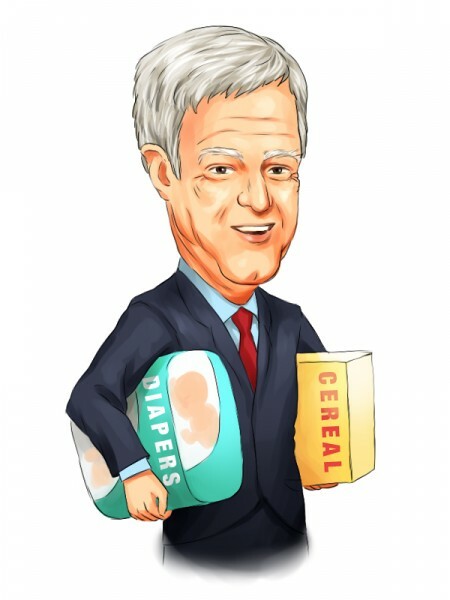 Let’s now review hedge fund activity in other stocks – not necessarily in the same industry as Brown-Forman Corporation (NYSE:BF-B) but similarly valued. We will take a look at Interactive Brokers Group, Inc. (NASDAQ:IBKR), Fortive Corporation (NYSE:FTV), The Hershey Company (NYSE:HSY), and Pioneer Natural Resources Company (NYSE:PXD). This group of stocks’ market values are similar to BF’s market value. As you can see these stocks had an average of 36.5 hedge funds with bullish positions and the average amount invested in these stocks was $1099 million. That figure was $621 million in BF’s case. Pioneer Natural Resources Company (NYSE:PXD) is the most popular stock in this table. On the other hand Interactive Brokers Group, Inc. (NASDAQ:IBKR) is the least popular one with only 21 bullish hedge fund positions. Compared to these stocks Brown-Forman Corporation (NYSE:BF-B) is even less popular than IBKR. Our calculations showed that top 15 most popular stocks among hedge funds returned 19.7% through March 15th and outperformed the S&P 500 ETF (SPY) by 6.6 percentage points. Unfortunately BF-B wasn’t in this group. Hedge funds that bet on Brown Forman were disappointed as the stock returned 6.9% and underperformed the market. If you are interested in investing in large cap stocks, you should check out the top 15 hedge fund stocks as 13 of these outperformed the market.